People mostly ignore the hosting part of creating a website. You will agree that having a new website is just a small step towards achieving long-term success with it. You need to maintain it well and host it on a reliable and secure platform for a very long period of time. Only then will your website or new blog be able to grow consistently and get plenty of regular traffic. But it is tough to select a good web host that will guide you right through the process of hosting your site, maintain good performance and resolve any related issues. This is because there are many reliable and popular website hosting providers that could fulfil your requirements. Two such famous web hosts are HostGator and GoDaddy. So here is an in-depth comparative study of the salient features of HostGator and GoDaddy, along with the different hosting plans and pricing plans offered by them. We want to compare these two hosting providers to assist you in choosing the right one for your current hosting requirements. HostGator was founded in 2002 and GoDaddy was founded in 1997. Thus, there is a big gap between the experiences of these companies. On the one hand, HostGator is owned by the Endurance International Group (EIG) and mainly focuses on web hosting services. On the other hand, GoDaddy offers other services in addition to web hosting, including domain registrations, SSL certificates and online provider for small businesses. In 2014, GoDaddy became the world’s largest ICANN-accredited registrar by managing more than 59 billion domain names. GoDaddy and HostGator are both Better Business Bureau (BBB) accredited companies, which means that they are committed to resolving consumer issues and complaints in a systematic manner. Both have also received the highest possible BBB rating of A+. HostGator has gone out of its way to being a part of green hosting and it even purchases certified Renewable Energy Credits (RECs). Based on the nature and the purpose of usage of your website, you may give priority to certain features. To help you decide which web host is ideal for the features that you consider important, let’s compare each hosting feature offered by GoDaddy and HostGator separately. HostGator gives you an uptime guarantee of 99.99% and GoDaddy offers an uptime of 99.9%. Over the past month (Jan 2017) Hostgator has been running at 100% on our test site. You want your website to be available to your visitors most of the time. We have hosted some of our websites with these web hosts in the past and found that the downtime percentage with GoDaddy is greater, especially when the load on your server increases. This makes HostGator a better host if your site regularly gets a lot of traffic. Even the time it takes for your web pages to load with GoDaddy is slightly greater than that of HostGator. Many GoDaddy customers have encountered this issue and there are relevant complaints online on multiple sites about this. In comparison, the customers of HostGator report far fewer issues about the page load speed or downtime. So, going by our own experience and by reading consumer reviews online, we find HostGator to be the winner for higher uptime and better speed. HostGator’s servers run on Dual Xeon, while GoDaddy’s servers run on Intel Core i7 processors and both allow you to opt for either Linux or Windows hosting. Your site is likely to deliver strong performance in either case. Thus, there is no clear winner in terms of performance, but from my experience with both hosts, I personally would go with HostGator on this one. You would not want to wait for support when thousands of visitors to your site are becoming impatient due to some technical glitches on your website. In such an emergency, you would prefer to have a technically proficient support team that can quickly resolve the issue. Thus, a solid customer support team is priceless for any webmaster. Both hosting providers offer 24/7 support for 365 days a year. With HostGator, you can use the telephone, live chat, and email or ticketing systems to get timely replies and issue resolutions. With GoDaddy, you will wait comparatively longer for a response from the support team. Hence, customers may become impatient with GoDaddy, especially in an emergency. HostGator is the clear winner here, because of the flexibility and quick response time of its customer support staff. HostGator and GoDaddy both provide you with access to the industry standard cPanel with your Linux hosting account. This control panel is extremely user-friendly and you will be able to start using it almost instantly. You will be able to install multiple applications required for your site with just a single click on both these hosting platforms. You can conveniently manage file transfer, databases and so on. If you opt for windows hosting from any of these two hosts, you get Parallel Plesk as your control panel. Both HostGator and GoDaddy offer the same long money back guarantee period of 45 days. So, if you are unsatisfied with their services within this time, you can opt out to choose another web host and get your money back. So, there is a clear tie between these web hosts in terms of money back guarantees. HostGator plans do not provide you with a free domain, but you get a free domain when you opt for any of the GoDaddy hosting plans. HostGator also offers less variety with Windows hosting than GoDaddy. We compare the Linux hosting plans offered by both below. The cheapest price for a HostGator hosting plan is currently $3.95 per month (for Hatchling shared hosting plan on a three-year subscription). But the lowest price for a GoDaddy hosting plan is $3.99 per month (for the GoDaddy Economy plan with a three-year or two-year subscription). Clearly, GoDaddy offers a cheaper option for a complete newbie who may not want to spend too much initially, but beware as when you renew after the 2 year subscription, the price rises to $7.99 per month. Quite a hike in costs for the long term! HostGator allows you complete flexibility as you can subscribe to all its shared hosting plans for a minimum of one month or a maximum of three years. The same holds true for the GoDaddy shared hosting plans, except for the most basic one which is the GoDaddy Economy plan. For this hosting plan, you need to subscribe for a minimum of three months. Verdict – HostGator all day! 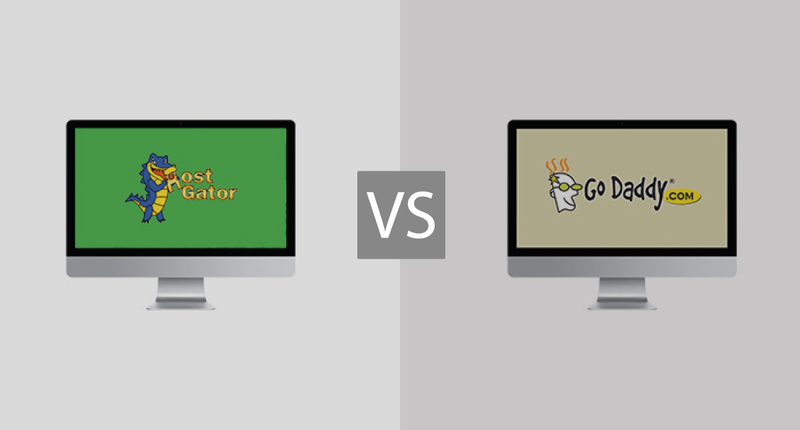 After going through the above comparison between HostGator and GoDaddy, it may seem obvious that HostGator is the outright winner. However, if you are looking for a hosting company that delivers many other services in addition to hosting, then GoDaddy could be the right one for you. Also, if you want to spend less money initially with a cheap shared hosting plan, then GoDaddy could provide it to you. Even in terms of Windows hosting, GoDaddy has more hosting plan alternatives for you. We hope that the above information helps you make the right choice for your web host, based on your requirements. Thanks for reading! I’m a perfectionist so I want things to be perfect all the time even though I know it’s not realistic. I’ve tried several hosting services before, even ones from those who claim to be the best website hosts. All of them disappointed me…except one: HostGator. This host’s performance is outstanding. Uptime results and speed are great–they never frustrated me. Their customer support is also excellent–very helpful and friendly. If you’re a small business owner and want a reliable host, go for HostGator.